These pictures were taken on the 20th anniversary of my father's death. My mother happened to be in town helping me as I recovered from surgery so the three of us had lunch, went to the cemetery and then to my sister's for a change of scenery and so my mother could spend some time with the kids. They were just being silly and fun like always. Rebecca is only 16 months here. She figured out how to make herself disappear behind the curtains. 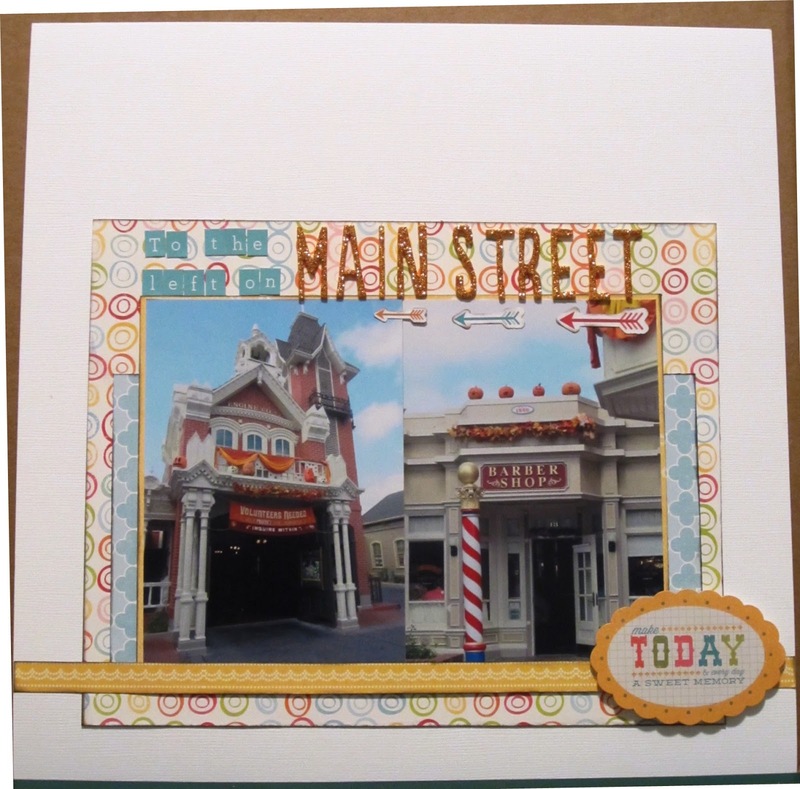 There is also American Craft thickers and Stampin' Up rhinestones. There is machine stitching on the embellishments and around the edge of the pink paper. Whenever I babysit, I always take pictures. Let me rephrase that, they take pictures. They are always at some weird angle, too close, too far way and generally out of focus. Ben took these pictures, he got a little close, don't ya think? But I love them. I used My Mind's Eye and Die Cuts With a View papers, Freckled Fawn wooden asterisks, bakers twine from the Twinery, American Craft Thickers. 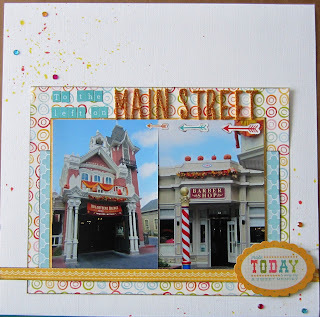 The big red Sizzix made a comeback for this layout - I used it to cut out all the tags and emboss some of them. I love how they look layered like that. I also overcame my fear of the sewing machine and added some stitching along the photos. There will be more of that in the next few pages. I’m sure Bob is not the weirdest cat on the planet but she must rank. Except for waking me up for breakfast every day, she’s a pretty sweet cat. She even wins over people who are not cat lovers, particularly my mother and brother in law. She’s cute and she readily purrs. She’s not shy and will almost always come out for company; she even jumped up on Don’s aunt one night she was over for dinner. Not so say she isn’t a kook! See how she is sitting on the door jam with her face right against the doorway. She does that all the time, all over the apartment – she’ll also sit facing a wall, the arm to the sofa. 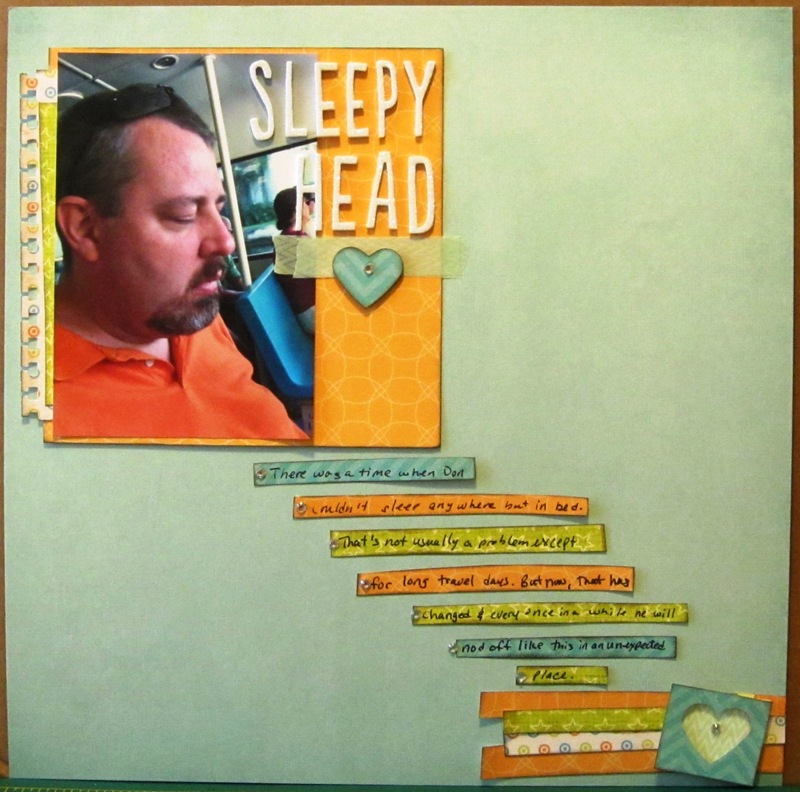 This layout uses paper from My Minds Eye, DCWV and Artic Frog. 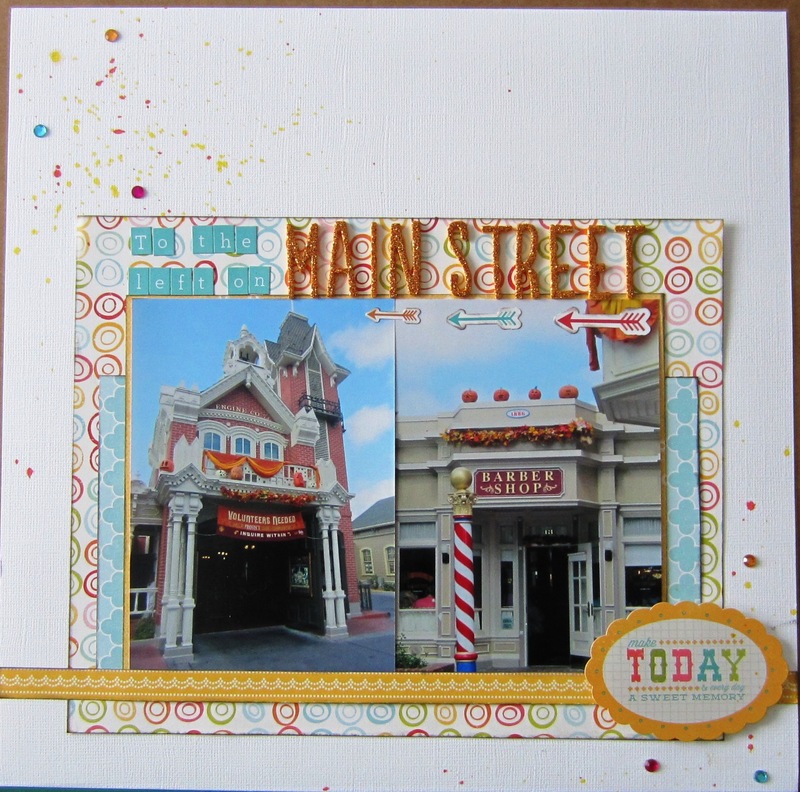 The lettering is from America Crafts, Veneers are from Freckled Fawn and the bracket is a MME die cut. I didn't think I would like the Dear Lizzy vinyl letters as much as I do. I keep using them to use them up but I realized that I really like the size and the font. This is a companion page to yesterday's layout. We ended up at the Milford Mall which was pretty big. We did some shopping, had pretzels, more shopping, had ice cream. They had a playground area which would have been fantastic if there weren't big kids taking over the whole thing. By big, I mean 12, 13 years old. They were just sitting on some of the apparatus taking up space. This layout used My Mind's Eye, Making Memories and Die Cuts With a View papers, American Craft Thickers, wood veneers by Studio Calico (chevron) and Freckled Fawn (arrow), assorted buttons and a journaling card by Echo Park. During Super Storm Sandy, my sister lost power for about 8 days. They got their hands on a generator so it wasn't as bad as it could be but it wasn't fun. It was noisy and ran on gas which was sparse so they just plugged in enough to have some lights, a warm area in the house and the television for the kids. Luckily, her good friend around the corner had a gas water heater so they went there for baths. Meals were mostly take out or on the fly. It could have been worse but it was exhausting. On this day, she needed to get some gas and we thought it would be easier in Connecticut since they didn't seem to have the shortage of NY and the rationing in NJ. We were right! We pulled into a gas station about 20 minutes away, no line, no price gouging. You'll see there are lots of sleeping kid pictures in my layouts. They look like angels when they are sleeping. Normally, they are quite the chatterboxes and their is lots of singing and carrying on in the car. Not today, they slept for a good portion of the ride. Although I loved the look on Ben's face when he woke up and saw me in the car, then woke up Becca to tell her that Ti Ti was here. Then she gets the same look. 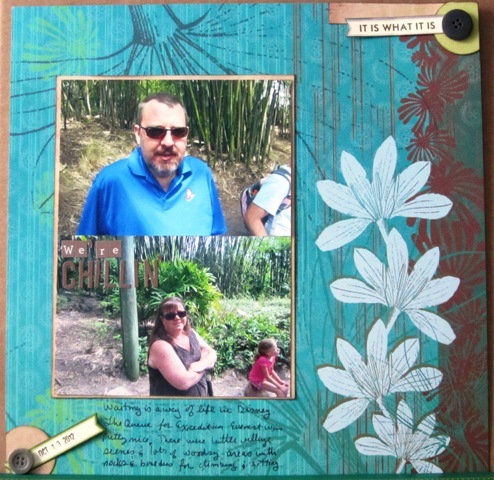 In this layout, I used patterned papers from Making Memories and My Mind's Eye, green pearls from Oriental Trading and American Craft Thickers. I used a library card stamp for the journaling, I don't remember the company, plus I pulled out an assortment of punches: EK success embossed scallop and notebook paper border punches, Martha Stewart heart punch and a Creative Memories circle punch. Back in November, I placed my first order with them for some wood veneers. I actually mentioned them in first post of my blog. They shipped right away and while the delivery confirmation showed they were delivered, they apparently went to the wrong address. I reordered the veneers since they are super cute and I still wanted them. Again, they shipped right away and this time, they were delivered to my mailbox! I sent an email to them asking (hoping) the original package was returned to them but they weren't. They were kind enough to refund my original purchase and offered a gift code for the problems with the order, even though it wasn't their fault at all. Wouldn't you know it? The original order showed up the other day! Exactly four months after the delivery confirmation date! Again, their service is outstanding and turned down my offer to return them. I could not recommend them enough! Really great products, reasonable prices, fast shipping and amazing service! I've been busy with my mother's visit and celebrating my nephew's fourth birthday so I haven't spent any time scrapbooking or blogging in the past few days. Hopefully that will change after tonight. The only scrap related news I have today is that a friend of mine gave me a pile of her wedding pictures to make a scrapbook album for her and her husband. They've been married for almost 7 years so there's no rush but it will be nice to work on different pictures. Although last year, after I finished up my third major gift album in a row, I declared that I was happy to work on my own pictures. 2012 was the second year in a row we had measurable snow in the fall. In 2011, it was right before Halloween and it was right after in 2012. When ever it snows, I usually take a picture of the tree across the street from the house. I think it looks pretty covered in snow. This time took another picture to capture the fall leaves that were revealed when the snow melted. 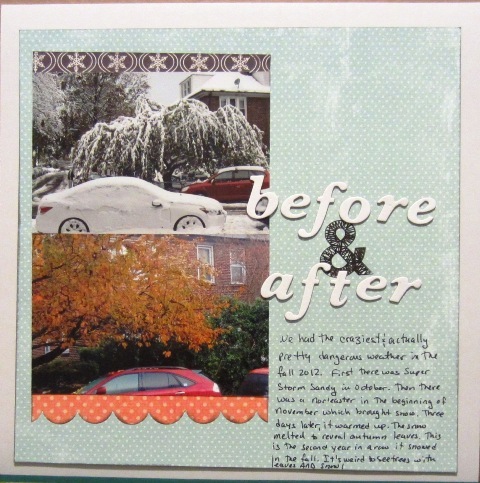 Here I matted My Mind's Eye paper onto white cardstock and added some trim from my scraps which reflects the scenes in each photo. The title is American Craft thickers and a Studio Calico stamp. Yep, still in Disney. 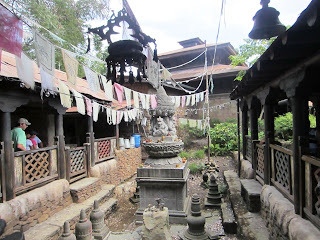 This is from the Expedition Everest line in Animal Kingdom. Like everything there it's well themed so you don't realize how long the line is and I suppose we're not supposed to mind the wait as much if it's pretty. This line is particularly well designed. There's a hunting cabin with artifacts from the Himalayas and also areas designed to look like area villages. Themed space on the Expedition Everest queue. The Audela des Cimes paper is a perfect match for these waiting on line pictures. It very much has an outdoor feel and while it borders on tropical, I think it works for these pictures. The photos are matted with My Mind's Eye paper from the Bella Bvd collection. The paper does the work here so I kept the embellishments to a minimum: Jillibean labels, buttons from my stash and Simple Stories letter stickers. Poor guy was so beat he actually dosed off on the short ride from EPCOT back to the resort. This is a super simple layout using a single photo. I noticed that I clustered everything together on the last few layouts I made, I decided to spread things out a bit here. The orange paper matches the photo almost perfectly so I went with that. For some interest, I added the little strips to the left. Since this page has a short title, I decided to have it overlap the photo. The journaling was written strips of patterned paper. There are strips of washi tape under the title to anchor it and it's also used in the negative space on the bottom of the page. This page hast patterned paper from My Minds Eye (background, green stars), Die Cuts with A View (white with multi colors, orange) and Echo Park (blue chevron) plus some washi and Stampin' Up rhinestones. Here's another entry to the Disney album. I should go through it one day and make a list of what I have covered already so I can fill in the blanks on future trips. I started with white card stock here. The block of pattern papers are Echo Park, the yellow border is the branding strip from Pebbles Inc Family Ties collection. The arrows and sticker are also Echo Park. The title is (of course) Simple Stories and American Craft thickers. I stopped there for a while but felt it needed something so I added the sprinkled Mr. Huey's mist and some pastel colored rhinestones from Oriental Trading. It's possible March was the longest month ever. It was great for scrapbooking but little else. That old saying "March comes in like a lion and out like a lamb" did not exactly happen this year. Since weather talk is boring, let's talk scrapbooking. I scored lots of great new supplies. Thickers seem to be multiplying on the table, I am not sure how that could have happened. Some of my older papers were put in the purge pile and others were put to the test. I made it half way through my Use It Or Lose It Challenge. It's becoming a struggle since a lot of the papers left don't match anything else in the stack but I don't have too many more pages to complete the challenge. Because of all the shopping and my (re)newed commitment to using my stash, I also joined a 50 Projects or Bust challenge. On this one, I am going on a shopping freeze until I complete 50 projects. It's not limited to layouts so I may make some cards with the scraps I am generating. They are starting to accumulate and something needs to be done. Do you have any scrap related goals for April?